Homogenous U-cups (block vees) are a non-loaded, single material U-cup. 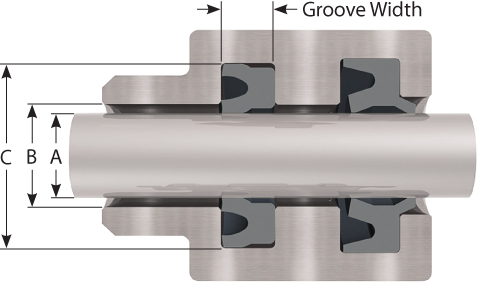 The HU seal is popular in low pressure applications where a low friction seal would be beneficial. The seal is most commonly used in pneumatic applications as a rod or piston seal. The design is suited for situations where space is limited. The HU seal is typically made from an 80 durometer Nitrile but also comes in Viton®/fluorocarbon, Neoprene and other homogenous materials. 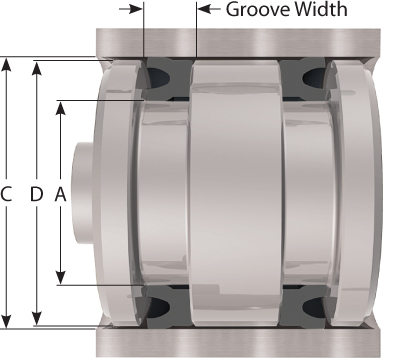 As pressure is applied to the homogenous U-cup the seal experiences an increase in sealing force until it reaches the maximum pressure the seal can handle. 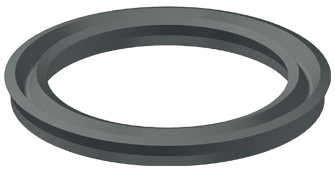 Homogeneous U-cup seals can handle up to 500 PSI; however, if you have applications that require higher pressure capabilities please consult a Hi-Tech Seals’ sales representative. The standard homogenous u-cup has a u-shaped groove formed in such a manner that there is an inside and outside sealing lip. * Height is only listed if the axial height is greater than the cross-section. Example: HU - 0437 0688 - Nitrile Homogenous U-Cup - 7/16” Nom. I.D., 11/16” Nom. O.D. Go to Homogenous U-Cup size charts.